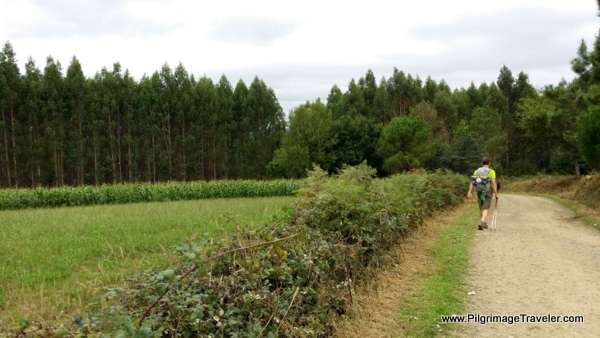 Our day thirteen on the Camino Primitivo was our final day to experience all the emotions that seemed to present themselves to us as we walked our final steps into Santiago de Compostela. Yes, the above quote depicted how I felt on this day of our Camino! I felt like I was walking in two worlds. As our minds inevitably thought about the end of our pilgrimage, and the "What next?" questions arose, our minds still tried to stay in the present, that wondrous liminal space, far separate from the "real" world! Here is the Google interactive map for the final, day thirteen on our Camino Primitivo, with only 10.2 kilometers left to go. Lavacolla, was our starting point, just west of the airport. There are so many services in these final kilometers. 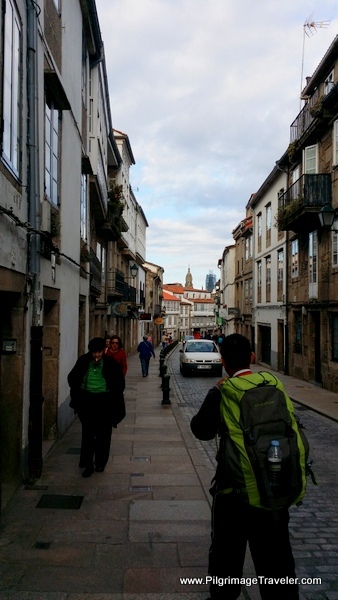 I placed accommodations on the map, along the way, but only albergues in Santiago de Compostela. 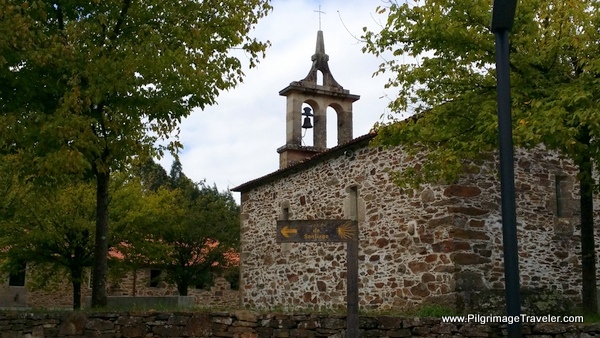 If you want to divert from the albergue experience upon reaching Santiago, click here for reservations. It is most important to have a reservation, to ensure that you have a bed, especially during high season and holidays! Many non-walking pilgrims come to this holy city and if you are walking, it would be unfortunate if you had difficulty finding a bed. Most of the private albergues will also take reservations! The two giant municipal albergues in SdC are the Residencia De Peregrinos de San Lázaro and the Albergue de Peregrinos de la Xunta de Galicia de Monte do Gozo, the first just inside the city limits along the Way, with 80 beds, and the second, on the Monte de Gozo (see maps) about 5.0 km before town, with 400 beds! Here is the elevation profile for the day. 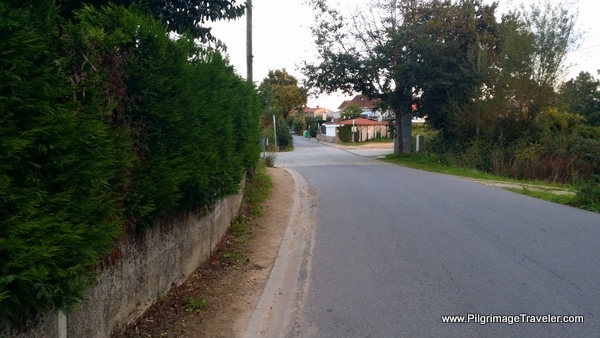 We had one somewhat significant hill left to climb at the beginning of the day, of less than 100 meters (320 feet) and then, it is all downhill from there into Santiago de Compostela. 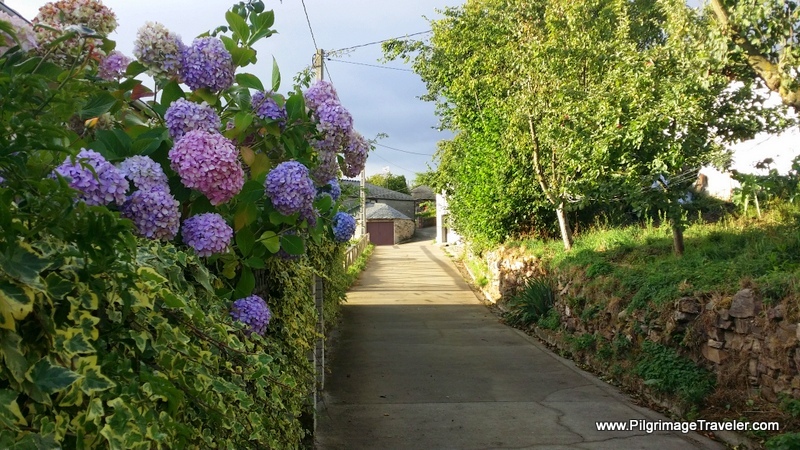 Upon leaving our cozy Casa Lavacolla before dawn, at around 7:30 a.m. at the southern side of town, the Way leaves the paved road and turns right onto a path for a short distance. 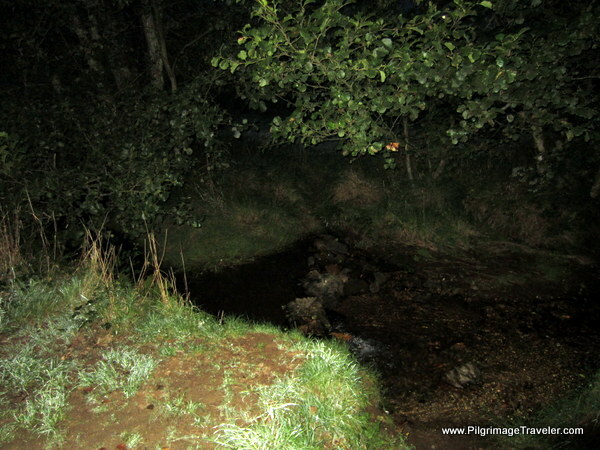 On this path, one actually crosses the Rio Sionlla, where there is an accessible spot to bathe in the river, see below. I had to take this photo, above, just for its historical significance, despite having to use a flash to see anything. I wish I had known about this spot the evening of day twelve, as I would have come here, waded in the "river" and sat for a while in prayer and contemplation. 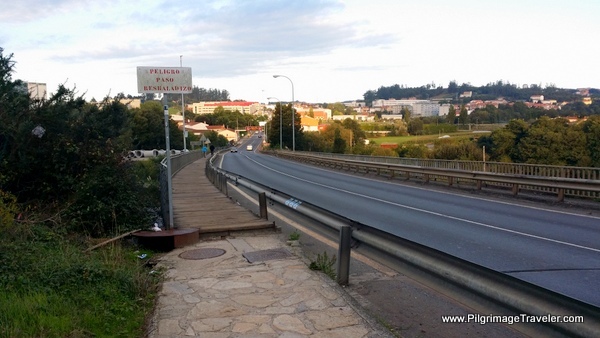 As I told in the story of day twelve, the modern plaza and bridge in Lavacolla are nice, but I was hoping to find just a spot as this, to contemplate the significance of this river where the medieval pilgrims would bathe before entering the holy city of Santiago de Compostela. 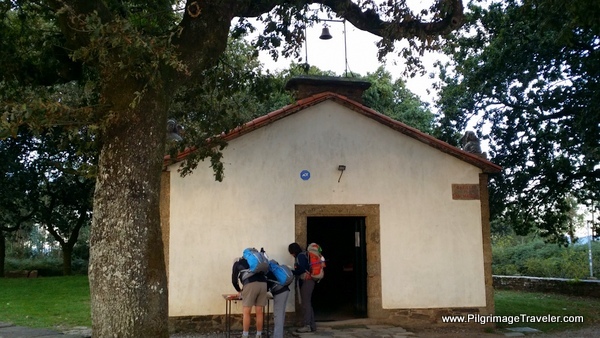 If you are reading this before your day thirteen on the Camino Primitivo, you will have the opportunity to do so, even if you do not stop for the night in Lavacolla. For the next four or so kilometers, I did not shoot any photos, as it was essentially dark, it looked like it was shaping up to be an overcast day, and there was not much that captured my interest. 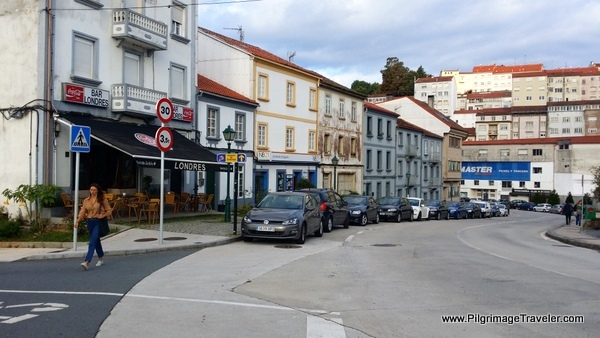 We walked through the town of Vilamaior and I just put my head down to walk to the elevation top around the Galician TV station. 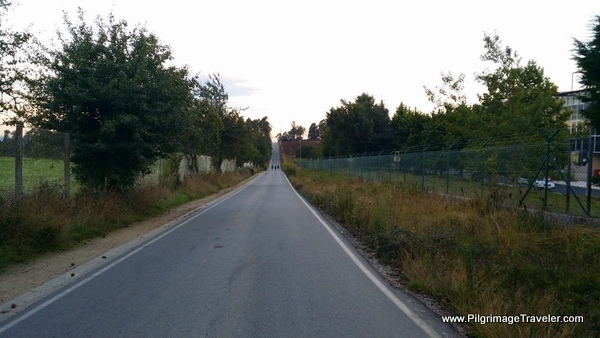 Here is a stretch of the long, straight and paved road, after leaving the TV station area and turning onto the road called Lagoa. This is not a very attractive area and is quite rural as you can see, with several industrial buildings along the way. By about 8:20 in the morning, the sun was starting to peak out for the photo below. With the sun up, as we approached these buildings, things appeared more attractive to me; an interesting metaphor. 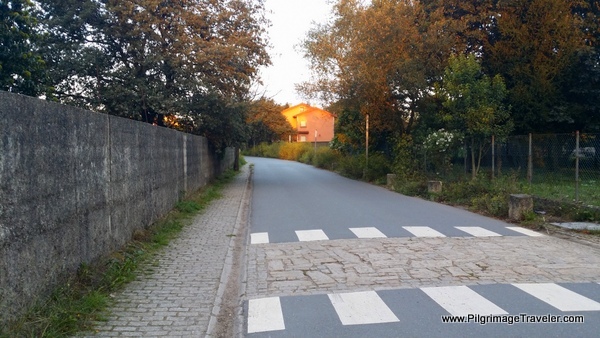 The Way leaves the Calle Lagoa, takes a short jog before turning left here on the Rúa de San Marcos, toward the famous Monte do Gozo, the "Mount of Joy." 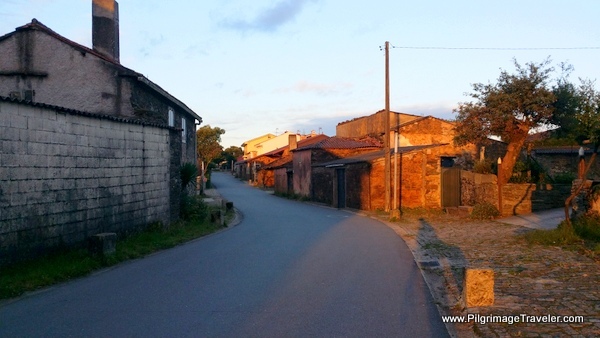 As the sun was becoming stronger, I was fascinated by the light on the buildings, as the Way became less rural on day thirteen of the Camino Primitivo. Rich and I talked and reflected quite a bit on our journey and its effect on us. 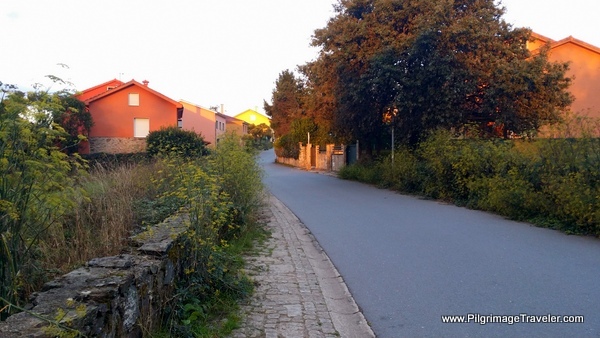 We were at peace with our journey, and the lovely morning light added to our contentment as we walked through the hamlet of San Marcos. 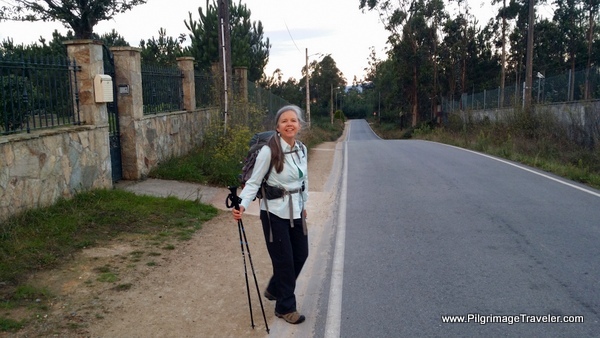 It was so easy to be grateful on this day thirteen on our Camino Primitivo, with Santiago de Compostela almost within sight and the glorious break-through of the sun to warm our hearts. Around this bend is the entrance to the park and monument of Monte do Gozo as we walked through the hamlet of San Marcos. 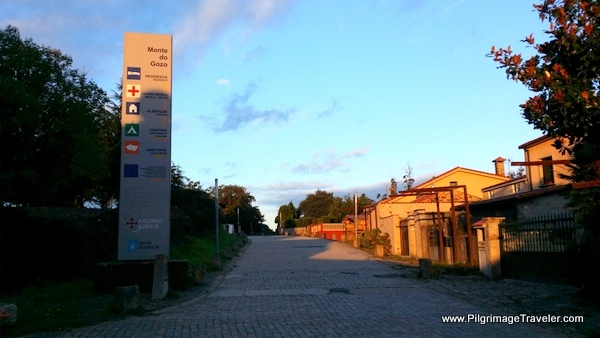 This sign, on the left in the photo below, marks the entrance to the park and the Monte do Gozo, the "Mount of Joy." It is said that on this hill, the pilgrims, who could see the towers of the Cathedral for the first time, would fall down in rapture. While we did not make it here by sunrise, the clouds were still fascinating. This modern monument may impress you, or you may find it to be an eyesore. It is certainly captivating, regardless. The monument was built to commemorate the visit by Pope John Paul II in August of 1993 where he said a mass for thousands, on that year's World Youth Day. Also, just below the monument is the Chapel of San Marcos. It looked relatively new, to me, but is worthy of a stop for more joy and reflection. The peregrinos are signing into the register, below. 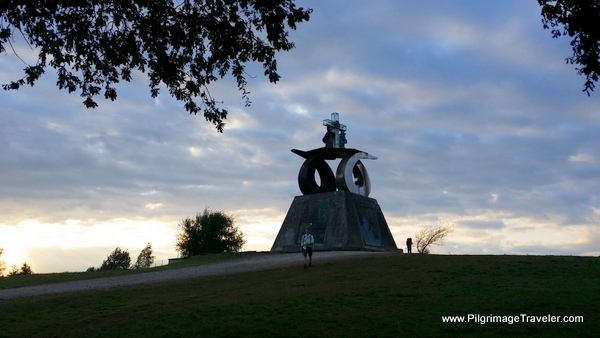 For some reason, I suppose insufficient research on my part, we did not know to go to the Monument ao Peregrino, just over the hill to the south of the modern monument. This is the monument of the two pilgrims, facing the cathedral spires of Santiago de Compostela. (Click on link to see the photo). I knew that it was on this mount that one could get a first glimpse of the cathedral towers, because I had read about it. I wrongly assumed that the glimpse would be from the top of the hill, and we walked all around the top of the hill to locate the cathedral in the distance, to no avail! In hindsight, I should have asked someone, but I just assumed that I had gotten my information wrong. If you desire to see this famous monument, and fall down in rapture at the first sight of the cathedral towers, make sure you locate it on Google maps, before leaving by the chapel on the Rúa do Gozo. I was so disappointed to have missed the cathedral sighting on the Mount of Joy! 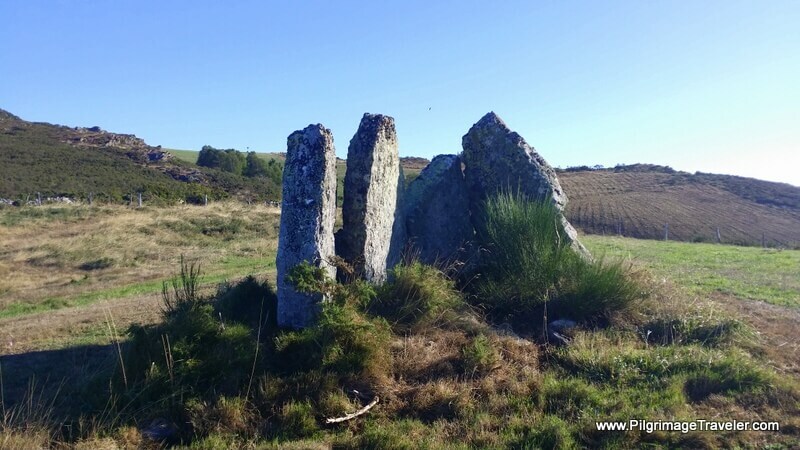 I did include the location of the monument on the interactive, Google map above, so you, dear pilgrimage traveler will not miss it, if you chose to go. 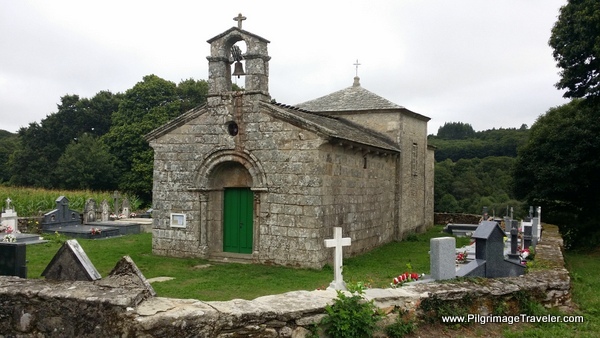 The municipal Albergue de Peregrinos de la Xunta de Galicia de Monte do Gozo is here too, so make sure you locate it on the map as well, if you plan to stay here. 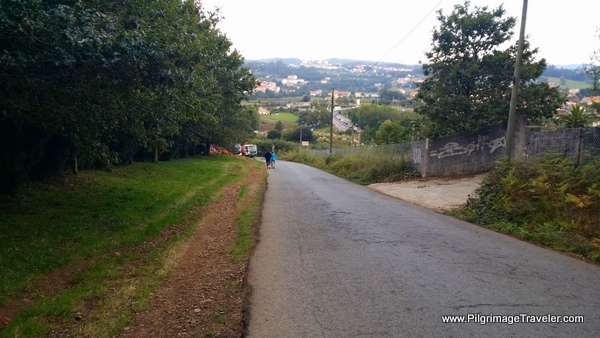 Onward we went, down the hill towards Santiago de Compostela on day thirteen of our Camino Primitivo. From the top of Monte do Gozo, the remainder of the Camino requires only about one more hour. Here is the pedestrian bridge that marks the outskirts of the city. 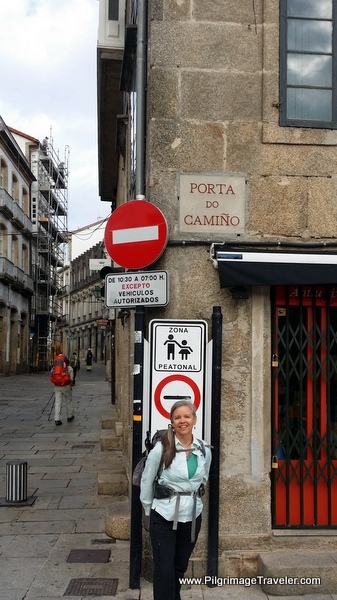 By 9:00 a.m. we had arrived at the city limits, marked by the red-lettered sign in the center, bottom of the photo, below, that says "Santiago de Compostela!" It is just beyond the first roundabout at the second smaller roundabout, that the San Lázaro municipal albergue can be found, just behind the museum, to the north. Look for the signs. We actually slowed our steps as we arrived into the city, as if to savor the final moments. 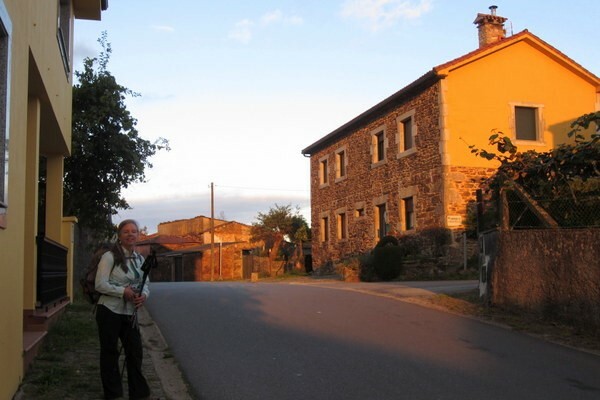 We certainly were filled with contentment, that our goal was in sight on this day thirteen of the Camino Primitivo. When I researched facts for this article, I read that it was the tradition for pilgrims to walk the final steps from Monte do Gozo to the Cathedral, barefoot. I was grateful that I was unaware of this tradition, as I don't know how practical this would be on modern city streets! We even stopped for a sort of celebratory café con leche and croissants, just after nine, before entering the main part of the city, below. It felt appropriate. Walking down the Rúa de San Pedro, the first glimpses of the cathedral towers comes into focus. For us, since we missed this on Monte do Gozo, this was our first glimpse! 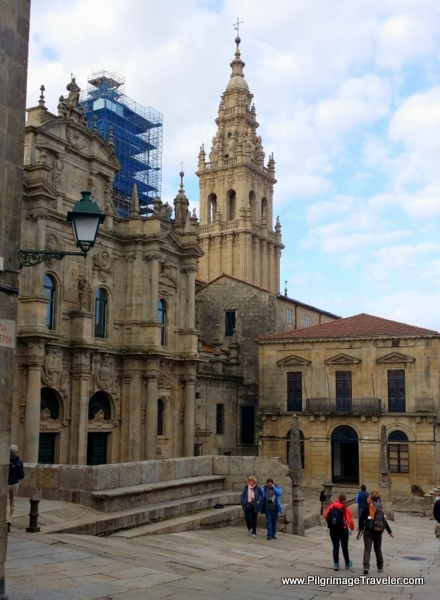 For my husband, Rich, who had not yet been to Santiago de Compostela, it was his moment of joy! (And for me too!) 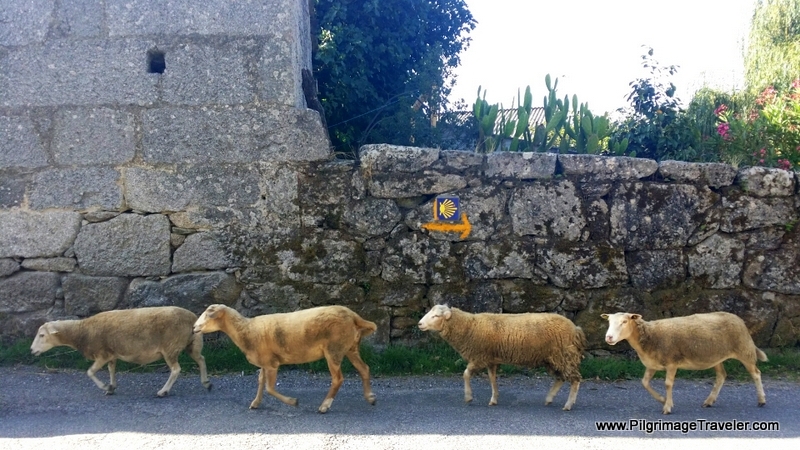 Fueled with our café con leche, we were now eager to get there, and quickened our pace! 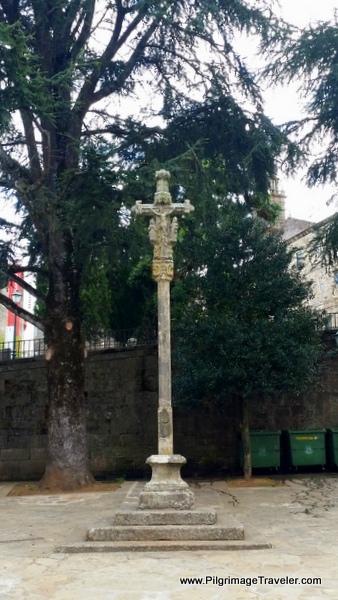 At the end of the Rúa de San Pedro, just before entering the old city at the Porta do Camiño, is a small plaza with park benches and this cruceiro. 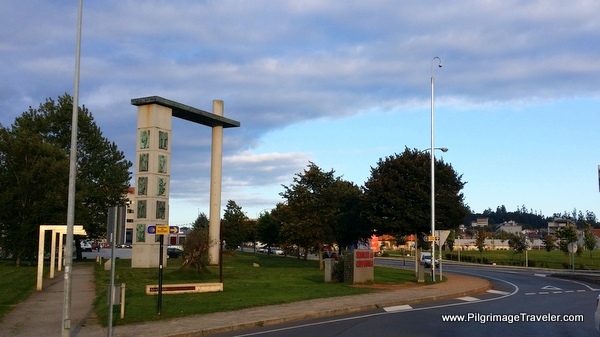 The Museo de Pobo Galega is just behind it. 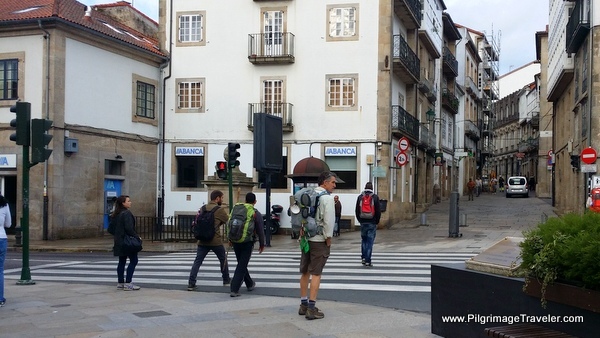 Here is Rich getting ready to cross the Rúa das Rodas into the heart of the city on day thirteen of our Camino Primitivo. 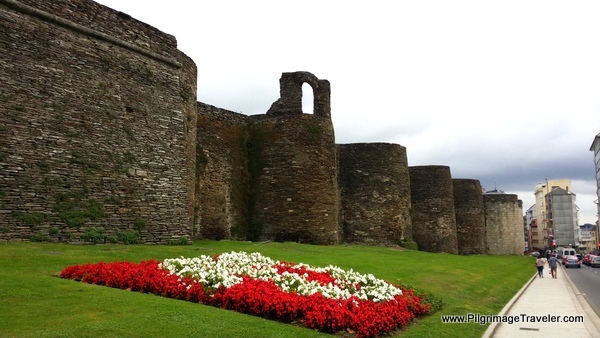 Here I am, below, at the famous portal into the City, the Porta do Camiño. This is where the original walls would have had a gate. We were mere steps from the the cathedral. and finally to the main Praza do Obradoiro, for the traditional victory shot! 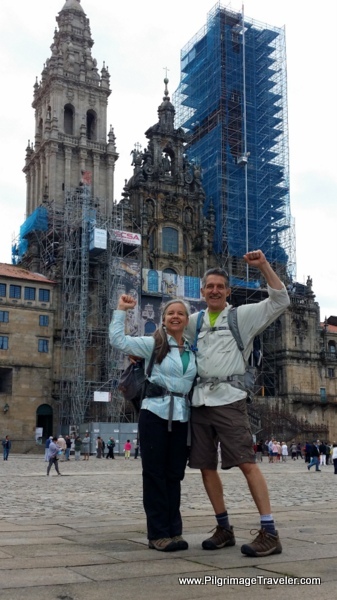 We had made it, indeed, on day thirteen, Camino Primitivo. Shortly after arriving on the praza, we stumbled onto Mattias. Despite his foot problems, he had made it. We contacted Glyvia, and she was also due to arrive shortly after us. We all gathered together for lunch, after the noon mass, at my favorite, the Casa Manolo for a nice family reunion. The food as always, was delicious. We heard that at the pilgrim's mass every Friday at 7:30 p.m., it was guaranteed that the botafumerio would swing. How lucky that we had arrived on a Friday! (This has since changed. Click here for the current schedule. In addition to this schedule, you may be lucky enough to be at a mass after a large tourist group pays to see it swing). We were able to secure seats in the section reserved for pilgrims by getting there one hour early. Make sure you bring your pilgrim's passport to prove that you are a pilgrim, if needed. We had front and center seats! And indeed, we saw the botafumerio swing! Click here to see more of this one-of-a-kind experience. 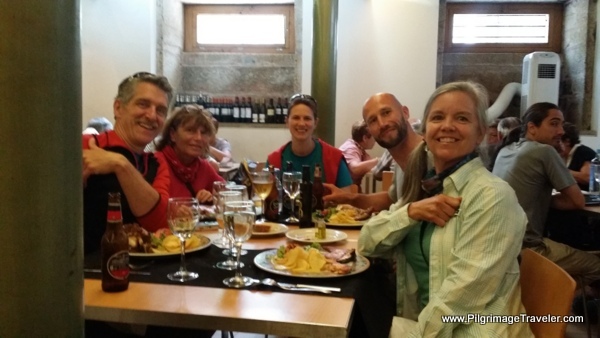 It was an amazing wrap for our final, day thirteen on the Camino Primitivo. The next day, after a nice rest, we met our friends again, to visit the cathedral museums and to do an amazing rooftop tour of the cathedral. This tour is not to be missed! 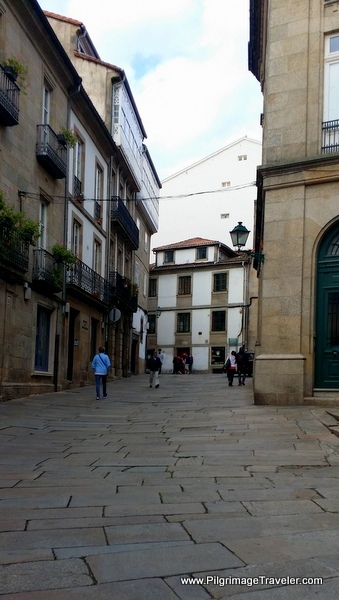 You may also wish to read more about the holy city, by clicking on Santiago de Compostela. 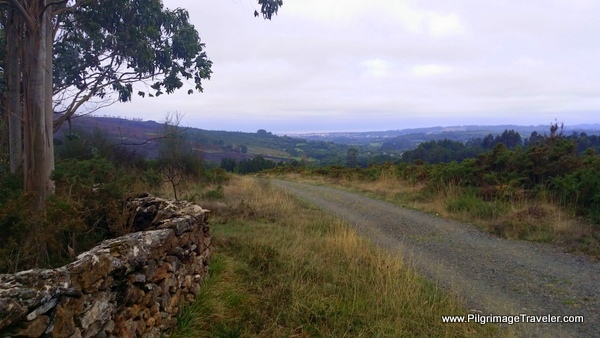 The final steps on the Camino Primitivo truly felt like I had one foot in one world and one foot in another. The day was fraught with many emotions that we had difficulty identifying. Was it relief? Was it joy? Was it simply satisfaction that we did it, that it was over? Rich says that for him, his primary emotion was sadness, because now we had to go back to the "to do" list and all it entailed. I felt an immediate emotional response to this for it rang so true in my own heart. Life would no longer be so simple again. I didn't want to go back to what we could see in our future at hand, the constant business of having a thousand things to do. We hoped and wanted to get over that now, and pace things better. We wanted a world in which there was no hurry, no reason to constantly be forcing ourselves to "do" stuff. We were hopeful that we would take this lesson home - the simplicity of the Camino, being in the moment, and the Presence of God in it all. It was so wonder to forget everything, forget all of our concerns, forget our responsibilities and duties, and even forget the date - if only for thirteen days! 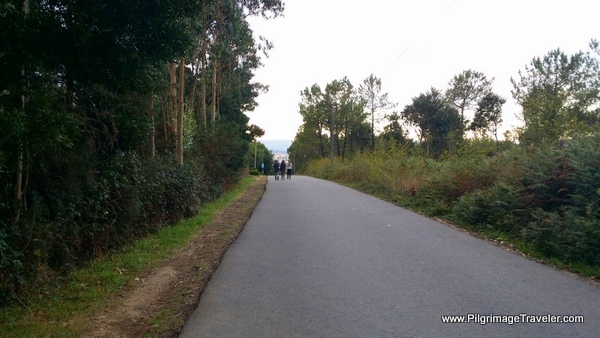 It was easy for us, and very quickly we had slipped into the present and simple way of being at the start of our Camino Primitivo and throughout all the days. We also knew too well how easy it would be to slip back into the busyness and craziness. We were feeling these emotions already, and were weren't even home. We also reflected on the angst and difficulty of travel for the medieval pilgrims and their great hope for healing and absolution; this seeking that had gone on for centuries as they journeyed to Santiago! Just speaking of this truth made me feel emotional because I felt the energy, the pain and the suffering they must have gone through in order to do the Camino. It must have been unbelievable. Some of them didn't make it. Some died along the way ~ or the way back. The most amazing thing in my mind is not only did the medieval pilgrims need to get to Santiago, but they had to figure out how to get back! We modern pilgrims don't get this, as we can just hop on a bus, plane or train to get back because the goal is merely Santiago de Compostela! Think how anticlimactic it would be for the modern pilgrim, for us to have to walk all the back from where we started! I would be SO discouraged if I had to walk all the way back to Oviedo! Most of the medieval pilgrims came from much, much farther away that merely Oviedo. All of this pilgrimage history is very interesting to reflect upon. To not lose sight of what has been here for so many years. Most modern pilgrims are here for there own sport and not much more. There is nothing wrong with that, but I just couldn't help reflecting on the dramatic difference between then and now! 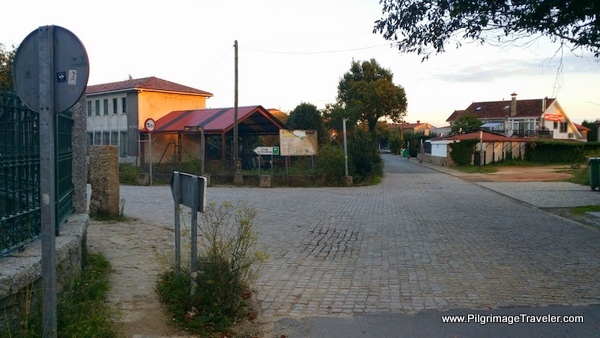 We did also feel true joy, there is no doubt, upon our completion of the Original Way and throughout our entire day thirteen on the Camino Primitivo. We did feel real relief, also. We did feel an incredible sense of accomplishment and gratitude to God from deep within our hearts. We did feel a sense of brotherhood for all we met and a spirit of community difficult to match elsewhere. Yet here we were on our final day and by far, the most overwhelming emotion was one of sadness that our journey was about to end. Already we were dreading going back into the "real world" and all its encumbrances. 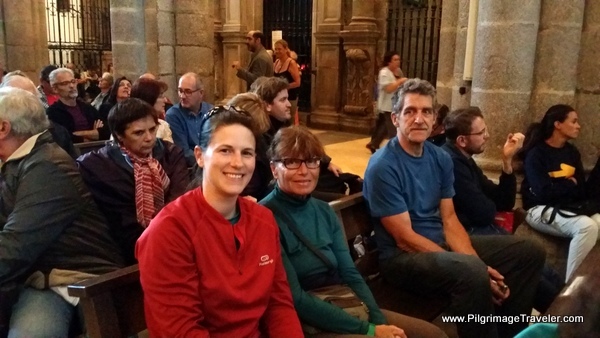 Reintegrating into life, yet keeping the Camino spirit was the real challenge. Which of the two worlds is real? Is the pilgrimage traveler one who successfully navigates both worlds? Yes, perhaps, as with the completion of each Camino, perhaps we can see more clearly, more quickly, more easily where we fail to marry our lives with simplicity, community, luminosity, curiosity and Presence to God! May your day thirteen on your Camino Primitivo be filled with wonder at your many emotions! May you carry with you the hope for completion and absolution, as you need in your own life. May your final steps on your Camino be blessed as you take your lessons learned, and navigate the two worlds with Grace, Love and Presence! Ultreia!